A strong economy lets those truckers roll. Plus, regional economy notes. Self-driving trucks may, or may not, be just around the bend. In the present, the human-driven industry is enjoying its best times in years. Tonnage hauled is at record levels, thanks to strong economic growth. As Americans buy more goods in the 10,000-mile supply chain — with the U.S.-China trade war on hold — some 70 percent of it is carried by truck once it reaches our shores. Freight rates are up. Shares of most big haulers are doing well. The industry is struggling to hire enough drivers. Another cause behind the boom is continued growth in construction, which feeds on materials hauled by truck. Also, new rules on electronic reporting of drivers’ hours (capped at 11) forced even small fleets and individual owner-operators to abide by the same requirements. Higher fuel prices haven’t crimped the good times. “Trucking is having perhaps its best year ever, at least since deregulation” in 1980, according to Steve Gordon, who retired as chief operating officer of Pacific-based Gordon Trucking two years ago and remains my go-to source on the industry. 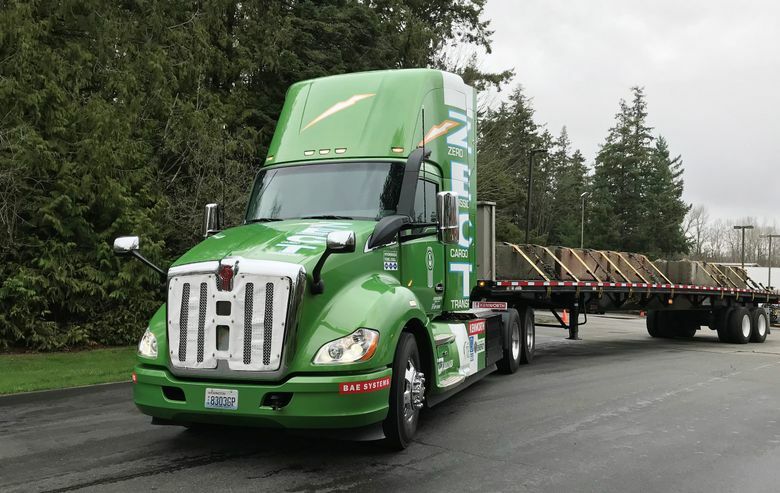 This ought to translate into good times for Paccar, the Bellevue-based company that makes two of the most legendary nameplates in trucking: Kenworth and Peterbilt, among a line of medium- and heavy-duty trucks and parts. It’s the world’s eighth-largest truck-maker. Paccar shares are around $66. It’s better than a trough of $44 in early 2016 but down from $77.64 in January. Gordon said truck builders faced a slide in demand two years ago. Truckers snapped up good-condition used vehicles, leaving manufacturers and retailers suffering from overcapacity. Indeed, orders for big rigs shot up to a record in the first quarter. And Paccar’s first-quarter earnings beat the target of Wall Street analysts, at $1.45 a share, up 88 cents from a year ago. It delivered a record 44,500 trucks in the quarter. The company’s balance sheet is solid as ever. Paccar is targeting capital expenditures of $425 million to $475 million, plus research and development expenses of up to $320 million this year. The R&D is aimed at new truck models, plus electric, hybrid and hydrogen fuel-cell technologies, among other advances. Paccar is also working on self-driving truck technology. Paccar logged more than 30 percent of the heavy-duty truck market last year in the United States and Canada, up from around 26 percent in 2016. It held 35 percent of the market in Mexico and smaller, but also significant slices in Europe and Australia. Talk about a company with a stake in trade stability. • The Carson College of Business at Washington State University just released a report on the perceived business climate of the Northwest. It’s based on an Edelman survey of 1,000 business leaders in the region. • Total civilian workforce growth in Seattle-Tacoma-Bellevue seemed to be slowing last spring and summer. Now it’s back to 3.1 percent year-over-year in April, in line with the increases seen since 2014. The metro hit a record of more than 2 million in April. • Washington saw the third-fastest growth in real personal income (adjusted for inflation) in 2016. The 3 percent rate was behind D.C., Utah and Georgia, according to a new report from the federal Bureau of Economic Analysis. The national growth average was 1 percent. Income growth in Seattle-Tacoma-Bellevue was 2.8 percent. The growth was not evenly spread statewide. For example, Yakima increased only 0.5 percent.